An outrageously inventive story app where kids get hands-on time with a fantastical food-making machine. Four-year-old Kalley has a problem: her work-from-home dad has decided to take a job downtown. Perceiving that her father works so that her family has food to eat, Kalley reasons that if she can design an elaborate food-making machine, then her dad won't need to leave her to work. 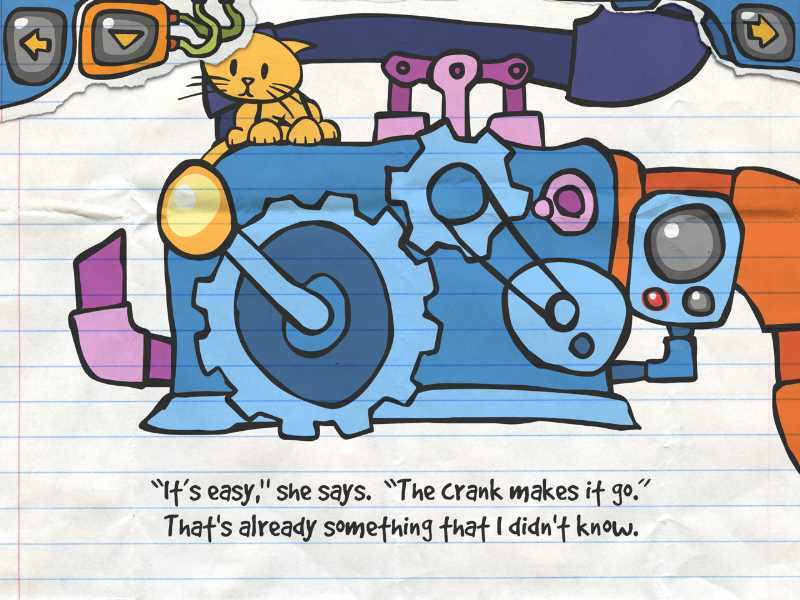 Within Kalley's Machine Plus Cats' 13 pages, readers explore Kaley's fantastical machine which has gears and gizmos galore. Readers turn handles and dials, flip levers, control smashers and puffers, design the food's shapes and colors, and even heat some foodstuffs with fire. 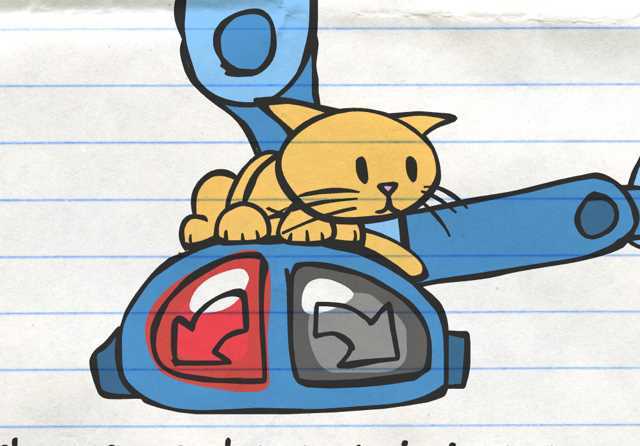 And throughout the pages, adorable cats provide comic relief as they sit on conveyor belts or scramble to get out of the way of spinning gears. What Makes This App So Good? 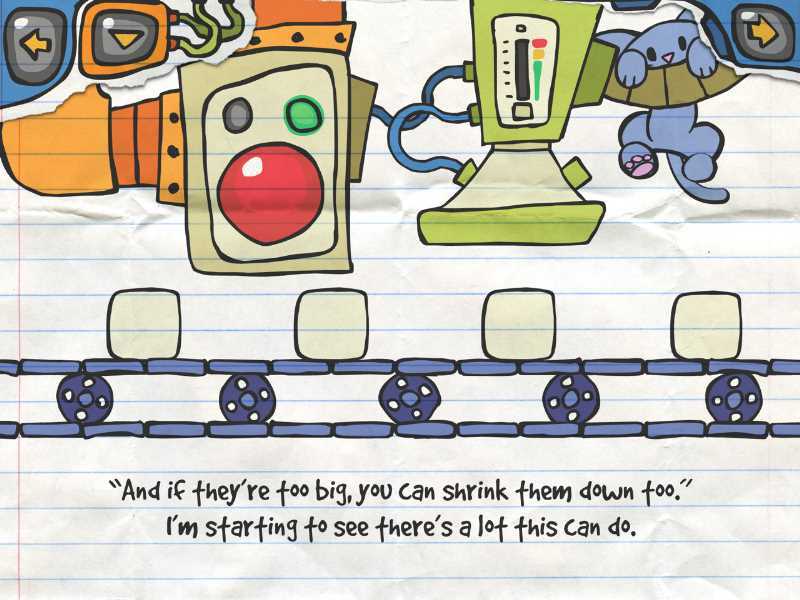 This highly interactive book app tells a rhyming story about a wacky machine. In several places, the app allows kids to fiddle with multiple dials or gizmos that interact with each other, thus creating an enticing environment for kids to experiment with cause and effect. Don't miss playing with the puffers to make marshmallows, because players can actually puff the food up so much that it explodes. Cute! The app also presents opportunities for families to discuss color mixing, gear ratios, air pressure and vacuums, and burning foods. And for teachers, this app ties into STEM. Kalley's Machine Plus Cats utilizes technology in positive ways to help kids learn to read: it highlights words as read and uses touch-to-read functionality so kids can tap any word to hear it spoken again. And it has an excellent drop-down menu to let the reader control the father-daughter narration, the beat bopping music, and, hilariously, the presence of the cats! Kalley's Machine Plus Cats showcases a creative inventor who happens to be a young girl. It sends a powerful message to children -- especially little girls -- about thinking outside of the box to solve problems. By demonstrating ingenious engineering skills that would make Rube Goldberg proud, Kalley models outstanding problem-solving instincts and may motivate readers to draw similar machines. This story is based on truth: a little girl named Kalley did draw a machine. Kalley and her family (Dad Jon, Mom Carrie, and sister Corbett) formed RocketWagon to develop this app. Jon and Kalley narrate the app, and the family also worked on the art, animation, sound effects, and music. Be sure to check out the section at the end about creating the app, because it's inspirational. If you are interested in watching a video about the Story Behind , you can view it here. 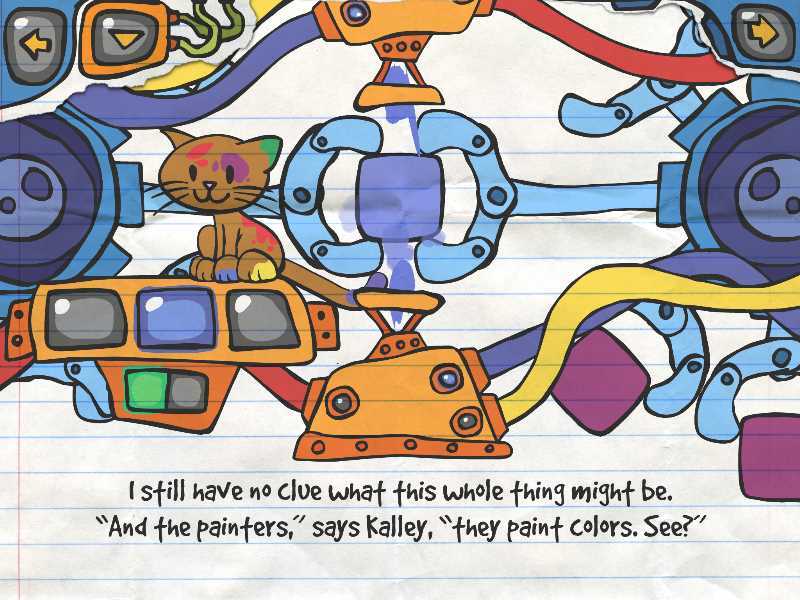 Kalley's Machine Plus Cats is a great read for little girls, because it shows them how females can be creative engineers. But it is also an important exploration for boys, because it shows them that girls can be builders too. And well, this machine is just awesome to explore! This Kalley's Machine Plus Cats app review was written by Jinny Gudmundsen.